Can You Get PTSD or Emotional Distress from a Car Accident? Mary was directing traffic at a construction site when it happened. She was wearing her fluorescent uniform and hard hat as usual when out of nowhere a car plowed right into her. Now she’s in the hospital with brain damage. She can’t remember her birthday or social security number, but she can talk well enough to say she misses her kids. Mary can’t stop wondering why she was hit. She’s worried about how she’s going to pay monthly expenses and mounting medical bills now that she can’t work. Sometimes she gets so angry she starts throwing things in her hospital room. Mark was driving at a roundabout when an 18-wheeler struck his car. He suffered spinal injuries. He’s accrued $30,000 in medical bills, but his insurance company claims they won’t pay for his losses. Before the car accident Mark worked as a laborer. He lost his job because of his injuries. And then the next job. Now each morning before his newest job, he has two choices: go to work and be in even more pain because of the physical demands of his job, or stay home, rest his back…with the risk of getting fired. Again. Mark says the accident has thrown his life into turmoil. According to the National Highway Traffic Safety Administration, more than 37,000 people died in car crashes in 2016. More than three million people were injured. Accidents leave physical scars, but they leave emotional ones too. Right after the accident, you may be in shock. But once that subsides you may have feelings of guilt, fear, anxiety, depression or stress that can linger for some time. Not everyone feels the same emotions, but it’s good to acknowledge you’ve been through an unexpected trauma and know it’s normal to have a reaction. And it’s good to know at what point you might need help. For some people who have been in a car crash, the idea of getting behind the wheel again, or even in a car again, can be very frightening. A person may be afraid that he or she will get into another accident. 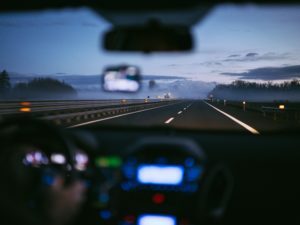 The person may have driven for years without an accident, but the recent trauma may cause them to avoid driving altogether. There may be fear of killing or harming a loved one in your vehicle if you drive. Or perhaps a fear that you may harm others on the roadway. Some might feel that their anxiety behind the wheel will be so great that they may suffer from a panic attack. They then are further afraid to drive because they fear this attack will cause another accident. If you’ve been seriously injured in a car wreck, your life might have taken a 180. You might not be able to do the same things you could do before. Your work and social life may be affected. This is a lot of additional stress and can leave victims of car accidents at high risk for depression. In addition, symptoms of depression are common in people that suffer from chronic pain. One study found that whiplash after traffic accidents can lead to depression. But the emotional trauma of being in a car wreck can put people at risk for depression who were not seriously injured as well. Even minor auto accidents are very stressful events. Depression can be felt in the body too, as headaches, cramps, aches or pains that just won’t go away. Not everyone who experiences a traumatic event develops Post Traumatic Stress Disorder or PTSD. It is normal to feel distressed after a car crash. Most people who experience trauma may temporarily have a difficult time coping, but in time the difficult feelings subside. If symptoms get worse, begin to interfere with your functioning and last for months or years, you may have PTSD. PTSD is a mental health disorder that interferes with daily life. Intrusive memories may include nightmares about the car crash, recurrent unwanted memories of the accident that are upsetting or flashbacks of the accident. You may have a strong emotional or physical reaction to something that reminds you of the accident. After a car accident, a person with PTSD might avoid thinking or talking about the accident. You might avoid all places, people, activities or anything else that reminds you of the trauma. Arousal symptoms are changes in physical and emotional reactions. A person with PTSD may always be on the lookout for danger. They may be easily startled or have trouble sleeping or concentrating, or have irritable outbursts and exhibit aggressive behavior. They also may be self-destructive. While it’s normal to feel distressed after a car accident, there is no reason to suffer long term. A phobia of driving, anxiety, depression and PTSD are real mental health disorders and there are ways to treat them. If you have upsetting thoughts or feelings for more than a month after your car accident, talk to your doctor or mental health professional. If your symptoms are severe or they’re getting in the way of you functioning, you don’t have to wait that long. There are people who can help you. It may feel like one more thing you don’t want to deal with at the time of an accident, but a Baltimore car accident lawyer can help lighten the load during this stressful time. Your attorney will work to get you reimbursed for damages from the car crash, including your mental illness. Damages typically include medical treatment, lost wages, and pain and suffering. Dealing with insurance companies who don’t want to pay can be stressful and there are numerous legal loopholes you have to jump through in to successfully navigate a personal injury claim. The right attorney will take care of all of that for you. And there’s no fee unless you win. Speak with attorney Randolph Rice today by calling (410) 694-7291 to schedule a free consultation.